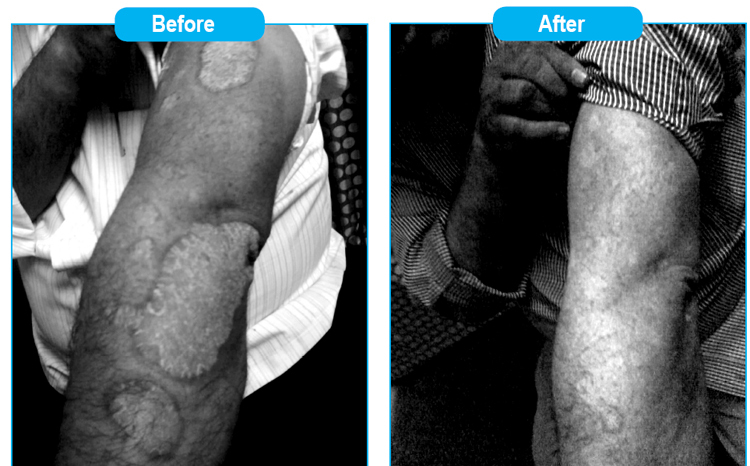 A fifty four years old male came with psoriatic eruptions both upper limbs since thirteen years. Eruptions mainly both arms and forearms with lower back also. Itching < Night+++, evening, cold weather++. Itching better in summer.Patient went allopathy and siddha for past many years but not improved. Known asthmatic patient since 10yrs taking allopathy medicine. Known Hypertensive since 8 yrs taking allopathy medicine. Fear of being alone, lack of confident . Depressed . Psoriatic eruptions both upper limbs with lower back , whitish scaling on affected places. Ars alb was prescribed based on miasmatic and constitutional approach. Sulphur given based on symptoms similarity . Both miasmatic remedies expelled suppressive symptoms and had given rapid recovery to the patient.